Nightwish and medieval battles, woo! In case the site doesn’t work (it’s very busy! ), I’ve posted it here too. People who don`t talk with each other for a year do not belong in the same band. You have said yourself that you are merely a ”guest musician” in Nightwish. Now that visit ends and we will continue Nightwish with a new female vocalist. We`re sure this is an equally big relief to you as it is for us. We have all been feeling bad long enough. You told us that no matter what, the next Nightwish album will be your last one. However, the rest of us want to continue as long as the fire burns. So there`s no sense in doing that next album with you, either. The four of us have been going over this situation countless times and we have realized that this is the thing we want to do in life. It´s all we can do. In December 2004, in Germany, you said that you will never tour again for more than two weeks at a time. You also said that we can forget about U.S. and Australia because the fees and the sizes of venues are too small. In interviews I`ve mentioned that if Tarja leaves, that would be the end of the band. I understand that people will think this way. Nightwish is, however, a scenery of my soul and I`m not ready to let go because of one person. A person who wants to focus her creativity to somewhere else, a person whose values don`t match mine. We were never bothered by the fact that you didn`t participate in writing/arranging songs, you never in 9 years came to rehearse the songs with us before going to the studio. Not the fact that while on tour you always wanted to fly, separately from us with your husband. Not the fact that you are an undisputable front image of the band. We accepted and felt ok about everything except greed, underestimating the fans, and breaking promises. 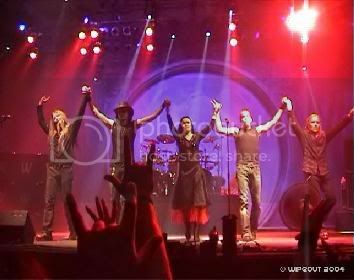 It was agreed by the five of us that Nightwish would be the priority in everything that we do during 2004-2005. Still so many things were more important to you. The ultimate example being the already sold-out show in Oslo, which you wanted to cancel because you needed to rehearse for your solo concerts, meet frieds and go to the movies. Those were the words Marcelo used in an e-mail explaining the cancellation. This being just one example of so many. I couldn`t think of a worse way of being selfish and dismissing our fans. Nightwish is a way of life and a job with many obligations. To each other and to the fans. With you we can`t take care of those duties anymore. Deep within we don`t know which one of you drove us to this point. Somehow Marcelo has changed you from the lovely girl you were into a diva, who doesn`t think or act the way she used to. You are too sure of your irreplaceableness and status. It`s obvious that you blame your stress and misery on us four. And you think we don`t respect or listen to you. Belive us; We have always had the uppermost respect towards you as a wonderful vocalist and as a friend. And very often during the past couple of years the plans were made according to your decisions only. You were always the only one who wanted more money from the shows. This ”compensation and more money from everything” –attitude is the fact that we are most disappointed of! We wish that from now on you will listen to your heart instead of Marcelo. Cultural differences combined with greed, opportunism and love is a dangerous combination. Do not wither yourself. Ps. This is an open letter for everybody. Well, my best wishes to all of the members of the band. May the music always live on. For some odd reason I always imagined "Sleeping Sun" being played to amid some kind of battlefield, just like that. I'm amused now to know that I've been on the same page as Nightwish now. Ha. That music video is awesome, at least from what I saw. Unfortunately that link doesn't work for me, so I went on another site, downloaded it, but it cut off after three minutes. Guess I'll have to look elsewhere. I'm also a bit bummed about Tarja leaving. I thought they were pretty close, too, but I guess not.... I never would have expected Tarja to have acted so selfish and pomous like that. It's like a serious punch in the gut. At least they're going to keep going on as Nightwish, though, and since Tarja never wrote the music their awesome lyrics aren't going anywhere, either. They say they're going to move on with a new female vocalist, so I'll be curious to see how they make do with her. I just hope she'll have an opera-like voice like Tarja's. Fixed the link now. It wasn't working for some odd reason. But if she is like that (truthfully), then I don't really think she belongs. It will be hard to replace her though. Hopefully they can find someone who meshs well with the band.